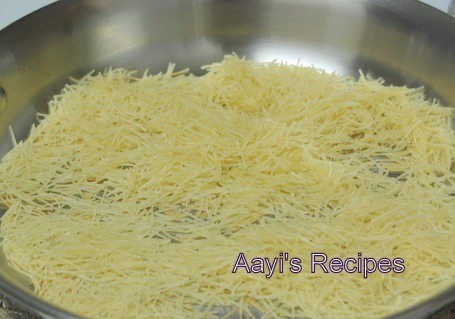 During my childhood, aayi was always there for us when we returned home from school. She had a set of dishes that she made for breakfast and another set of dishes that were evening snacks. My brother and I threw a big tantrum if she switched between the two. 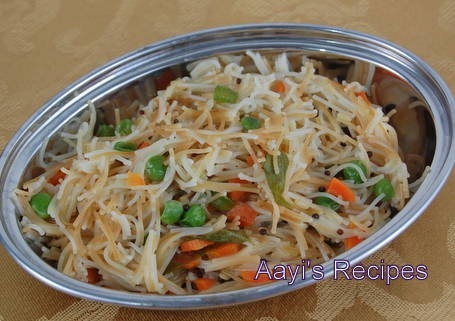 Vermicelli dishes like upma, idli were mainly prepared for evening snacks. We demanded different snacks every evening. Now for Ishaan, I try to make something fresh for breakfast, lunch and dinner. But I don’t make anything for the evening snacks. I keep breakfast very simple and sometimes even make these simple dishes for lunch. One such dish that I make for breakfast and lunch is this upma. I have tried different variations of these, but he seems to like this version the best. 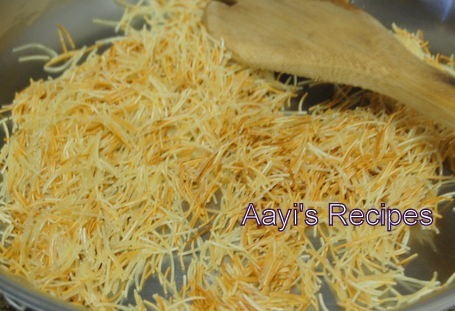 Heat oil/ghee and fry vermicelli till it turns brownish. Take it out on a plate, keep aside. 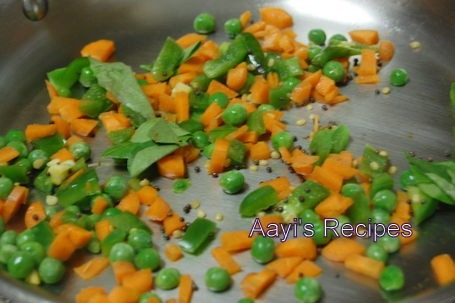 Heat a little more oil, add mustard seeds, when they start popping, add urad dal, green chillies, curry leaves. 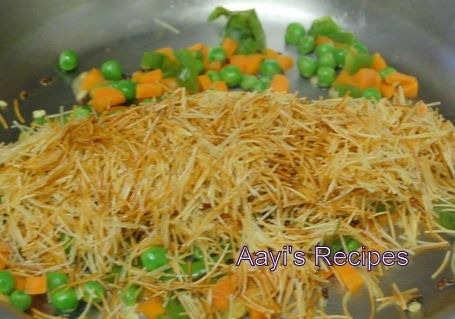 Add the vegetables and fry for few minutes. Add little water (a couple of table spoons), cover and cook till all water is absorbed. 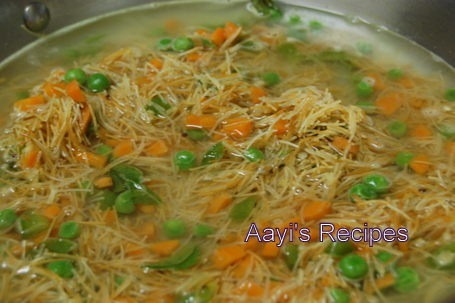 (I do this so that vegetables soften a bit, they get completely cooked with vermicelli later). Add garam masala, vermicelli, salt, sugar, fry for few minutes. Add remaining water, cover and let it cook completely. Garnish with coconut(if using). Serve hot. Looks absolutely delish and amazing. Of all the upmas this is the only one that is kid approved at home :). Comfort food always. This Upma looks great and mouthwatering. I love upma..it makes for such an easy evening snack and packed up with veggies..its so healthy! 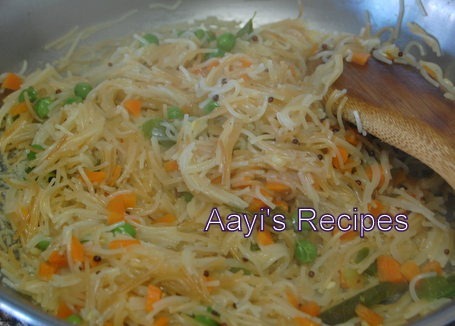 Love your version and will use up my vermicelli sitting in the pantry! Can you blog, how to make “Otthu shavige” it’s my fav one. I will give this recipe to my wife, so that relish it. Just a suggestion-try using spaghetti or Orzo(rice-shaped pasta). My nephew used spaghetti.Only thing is you will have to precook the pasta. Your site is very informative and useful. Thank you. Wow. i have only made Vermicelli Kheer till now but this new recipe of vermicelli upma seems to be awsome. Lets try this. Wow.. this is my daughter’s favorite breakfast..
is this gothi savige or akki shavige?? Too delicious & yummy to eat. A complete breakfast meal. thank u shilpa:)…looks yummy!!! will definitely try this. Ur recipes r great.I tried vermicelli upma. Today. It came out well kids loved it thanks for ur yummy recipes. Keep posting. I made this with the same proportions, just a little more of the veggies. I’ve made it twice n it turned out great both times. Thank you for a good recipe!